There was a suggestion recently (see "Busting the Innovation myth") that innovation in back office operations wasn’t important and it’s all about the "front" office. We would argue that achieving innovation in the global support operations of businesses, is often the only lever most firms can pull to remain competitive in this economy. Can BPO engagement models broaden to help businesses stay ahead of secular changes? In the pharmaceutical business, for example, the increase in the use of generics is bringing the issue of cost and speed-to-market into play. In previous times, innovation was focused primarily on research and development of new blockbuster drugs, but with those becoming fewer and further between, combined with the massive M&A activity in the sector, the innovation focus has quickly shiften to the support operations and the supply chain. With generics, there really isn’t much you can do to differentiate by product, but you can compete on price and respond to market demand quicker than your competitors. Driving down production costs across both manufacturing and business operations processes is critical, and having a global support infrastructure to get these products to market, and keep inventory levels optimized is how to stay ahead of the competition. Core sourcing challenges: BPO providers need to step up their competency delivering managed supply chain processes that encompass master data management processes and other supply chain functions, to help their customers. It's not simply about payroll and payables anymore; life sciences firms need to drive their providers to invest in taking a greater interest in creating new ways to reach their markets faster and more intelligently. In the media business, the impact of web 2.0, social media etc., hasn't altered the actual "products", but the way in which they are delivered to - and consumed by - the end-customer. For example, the diminishing need for printed media products is shifting the focus to driving out as much cost from the operation as possible so media firms can invest in quality content to remain in business. Core sourcing challenges: The bottom is getting ripped out of the media business at an alarming pace and media firms have no choice but to eliminate as much cost from their distribution channels as quickly as they can, in order to survive. Many media firms have run out of time to go through gradual transformation; in most cases, they simply have to find providers which can enable rapid lift and shift deals to rip out as much short term cost as possible. Then they have to streamline the operations in the BPO environment as quickly as they can to take advantage of the cost take-out (see Surviving the Aftermath of a Lift and Shift Transition). Being able to grasp - and live - with such rapid change, and find a provider which can work with you to ahieve that is the only way forward. Selecting the wrong provider in this market could be fatal. In financial services, the appetite to move away from captive-only support models is helping many firms find new levels of cost-elimination, but also new flexible models for improving the delivery of their current services. Banking and insurance services aren't changing that much per se, it's how effectively they are delivered to market that is providing the competitive edge. Deploying more flexible and sophisticated global sourcing models, is the only way to go for most financial services firms today. By staying with jaded and often expensive captive operations, is holding many financial services firms back from being exposed to new ideas, new process flows, and the new energy some BPO providers can bring to the table, based on their experience with many other enterprises. Core sourcing challenges: The majority of financial services enterprises are busily shopping their captives at present, and only a few will find willing service providers to buy them. Most providers now have the scale they need, and are only interested in specific niche competencies that give them new capability. Many financial service firms are facing the prospect of having to phase out their captive operations in order to move into a blended, or fully-outsourced, operational support environment. They will need to decide whether or not to write-off years of investment in their captive operations, in order to transform their delivery model. We’ve spent the last few weeks having intense dialog with buyers regarding how the uncertain, but recovering, economy, is impacting their stance on outsourcing, and the common thread is one of speed and urgency. There’s a genuine impetus from business leaders to act on new efficiency drives that were formulated during the recessionary months – and global sourcing strategy is right at the heart of these. The conversations dominating this week’s SSON show in Orlando left us with the phrase “the relentless pursuit of cost elimination and efficiency” firmly etched on our minds. Our argument with current BPO engagement models is that they have to encompass more than simply a few administrative processes to be truly effective. If your BPO provider is only fulfilling a few standalone functions such as purchasing, or invoice processing, it's going to be very difficult for them to achieve much more than a few dollars shaved off the labor cost, and perhaps some elimination of duplicate tasks and unnecessary process steps. In order to find that next level of performance, you need to take a broader view of your entire global business operations and find ways to bring your BPO partner into the heart of your critical data management processes, so they can help you source unique and creative ways to be more productive and source new avenues for growth. 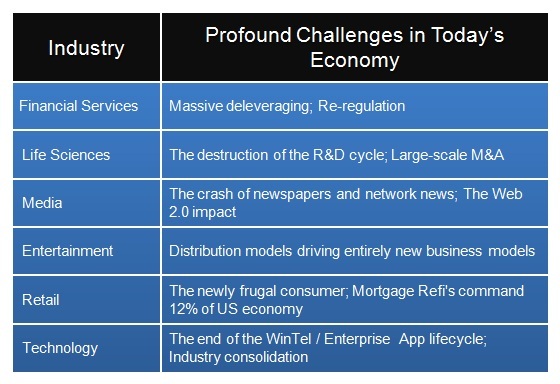 Innovation has always been at the center of major shifts to either correct problems or to eveolve a new sector. In the small is operative innovation, those steps needed to improve/or correct a ongoing condution. On the other end of the scale is blue sky innovation involving where we fling ourselves at the white space that exists between current behavior and unknown opportunities. Those that believe that you can learn this or commoditize this are only fooling themselves, in a very personal and real trait contained within the individual and folks that they operate with. As with all innovation often faces challenges but that ah-ha moment is the seed to which pragmatic solutions can be delivered. The post release of innovation is often met with skepticism because it's out of context with present behavior. But for those who have innovated a solution it is based on countless hours of thinking, conjecturing, testing, and reexamination that puts for a strong business case/conviction. We might wish to add two more to your chart; Outsourcing Sector - Buyers and one for Supplier challenges. I'm sure you could add a flotilla of challenges that these two segments face. I think that in a capitalist world, it is always about more, and more, and more revenue. I worked at Microsoft for over 10 years, and we only looked at reducing costs during crisis-times, but always focused on growth - and no matter what the percentage was, it was never enough. We achieved it each and every time (sometimes we missed by a small single digit), but when it came down to enhancing our cost centers and improving our services to adapt, we could never do it right, simply because of the mindset in which we operated. Innovation is very much driven by the culture of the organization, and if it is not embedded in there from the beginning, it will not work. We even had managers resisting the change and therefore it was rarely successful to innovate in the back office. I very much agree your statement because innovation in the back office will not only create better profitability but improve agility as well…..
Too often, or in some companies not often enough, innovation is driven by the "front office", by creative individuals and teams who are on the fron edge of closing the deals, and bring Vision, Mission, support and materials 'through' the front office, to the froint lines, to sales and project completion. Too often "back office" relies on a regimen, a routine, that manages everything from compliance to standardization to authentication that does not allow innovation. it's unfortunate, because developing key, identifiable 'innovators' in your back office, will feed your front office not only with ideas and other resources, but provide inclusion in teams, and career development, to grow your organization from within. Not everyone can be everything and since Innovation is not a skill but a virtue there may be many innovation jobs; some in support, others in delivery but only a few will be bestowed with the ability (gift) to contrive. Innovation is overrated and oftern confused with process improvement. Innovation is the extreme end of information food chain and I think barring a few industries most industries are still at various stages of Data->Information->Knowledge->Insights. Innovation in BPO is at least a few years away because most of the BPO business relationships are less than a decade old and we need to travese through the value chain described above before Innovation can be quantifiable, measurable and consistent. Agree most BPO relationships are still immature, but that doesn't take away from the fact that innovation across business operations is critical for many firms today, and BPO as a delivery mechanism has a pivotal role to play in helping them find new levels of perfomance. "Process improvement" really just translates to achieving adequate operational standards, whereas innovation is about finding new, unique and creative ways to source new avenues of productivity and/or sources of revenue. Hi Phil, I see you are at it with your spotlight on innovation for weeks now - it’s my favorite topic so could not resist some more trots and struts with the Horses. I see a kaleidoscope of opinions on this topic at the Horses - I must start by offering to agree completely with "the motion" that “the relentless pursuit of cost elimination and efficiency” should be the next major source of innovation in "back-office outsourcing" and it is round the corner if not already in. Let me start by throwing some core perspectives on what is innovation and what can be its possible sources - and since I am but so insignificantly qualified to comment on innovation, allow me to borrow a few sentences from the most undisputed guru on this subject, Peter F Drucker. Drucker said, (Innovation and Entrepreneurship: Practice and Principles, Harper & Row, 1985) "Innovation is the specific function of entrepreneurship, whether in an existing business, a public service institution, or a new venture...by which the entrepreneur either creates new wealth-producing resources or endows existing resources with enhanced potential for creating wealth." So innovation, is not about back or front office, it’s about that entrepreneurial zeal to deliver the "enhanced potential for creating wealth". We all know wealth to an enterprise is all about enhanced shareholder value and that can come either from significantly higher revenues or significantly lower cost or both. Drucker further argues " Most innovations, ..especially the successful ones, result from a conscious, purposeful search for innovation opportunities", and he goes on to outline that there can be seven such key types of innovation opportunities arising primarily from – “unexpected occurrences, incongruities, process needs, industry and market changes, demographic changes, changes in perception and new knowledge." I think the Horses team did a brilliant job on putting on the table some major potential sources of innovation, as we see it today – some of them can be classified as industry and market changes, some as unexpected occurrences or incongruities. These sources can either inspire innovation in the front office or at the back, or both, depending on the focus of the entrepreneurs in the specific businesses. So believe me or the Horses or Drucker, it’s high time that it did. And this innovation can erupt either on the demand side or the supply trenches, but erupt it will and spread like some wildfire soon. Consider this case – a mid-size private equity company based in Midwest US – decides to carve out and buy a particular business from a large medical equipment company – but only decides to carve out the manufacturing, distribution, marketing and sales resources from the seller – it expects to outsource, turnkey, the back office functions like, HR, Finance and other supply and demand support. They wish to have only the CFO and a controller of global finance on their payroll and outsource their entire finance function complete with relevant application infrastructure, for a market of 20 countries and their wish is to go with one or at best 2 global providers. Now that is not Finance & Accounting outsourcing, that is finance function sourcing - where the client expects you to receive transactions, process them, approve them, do regulatory compliance and just sign off the budgets from their CFO after advising him what to sign-off. By running the new entity’s finance and other back office in this manner the PE company only wishes to remove all stops from forecasted rapid growth goals of the acquired entity, which will give them their bang for the buck. Qualify it with Drucker – is it not about going after, “enhanced potential for creating wealth”. If it is, there you go, you have an innovative model for back-office sourcing. And has the client not done what the Horses are prodding him to do - “take a broader view of your entire global business operations and find ways to bring your BPO partner into the heart of your critical data management processes, so they can help you source unique and creative ways to be more productive and source new avenues for growth.” Now that is an extreme but real example only to illustrate the point, but the back office is at the centre of the table and tables are turning. So Horses and your zeal on innovation in global sourcing - trot on, way to go – God Speed. Phil, I feel compelled to clarify that in"Busting the Innovation Myth" I did not intend to imply that back office innovation wasn't important, just that the individual sourcing relationship wasn't the place to do it. Providers should absolutely innovate their delivery and contracting models, and by passing on some of those benefits to a broad customer base they will be successful in the marketplace. Where it has failed to work, and where the concrete example has yet to be offered by the Horses readership, is in the context of a one client, one provider relationship. -If my core business is accounting, then I absolutely should innovate in the field of accounting, because similar to my client making widgets, it is through this innovation that I win and sustain business. Either business doomed, ultimately, if it fails to innovate in what counts for its customers. That said, I think Charlene's comment is insightful and brilliant--if an outsourcer figures out how to truly work across that "door" with its clients, then I may have to change my ornery, stubborn, insistent position on this topic! All costs associated with the business (and that includes the operations) add to the cost passed on to the customer. It is therefor important to also streamline and evaluate all business processes in your own company to realise and understand what needs to be done to keep your customer focus and competitive edge. It’s both interesting and amusing to find us all ‘arguing’ our corner on who has the most important role to play in delivering a strong company performance. Being in the Purchasing “arena” we tend to be arguing how purchasing is fundamental and needs more attention. Have a guess what those in the sales “Arena” will be arguing for? In fact, have a guess what any other department is arguing for? In my opinion, "Front Office" innovation has more importance (added by preceptions as well) because there it the greater need of survivability in the market i.e. push & pulls of markets and to reach the end consumer faster. "Back Office innovations", though equally important, are more subjected to Company Culture, Mind Sets, Working Habits/Styles, Fixed Norms or Regulations etc. hence takes back seat (or faces resistance). Various Process have also been devised to cater & revoke the need of innovation in this area e.g. Kaizens, 6 Sigmas, S&OPs, CPFRs etc. Further to deal with associated difficulties - a complete subject on "CHANGE MANAGEMENT" has been created. Finally, I think, only those companies who give equal importance to "Back Office Innovations" in Business Operations can take the edge/lead in this competetive world (driven by "Front Office Innovations") e.g. Apple, Nokia, Coca Cola, Wall Mart, Sony, & Toyota - to name a few - are industry leaders from both Front & Back office point of view. Through their "Back Office" Innovations in Businees Process they are not only flexible, fast, & competetive but also are adapting their own processes faster with their own "Front Office" innovations. So by adding Back Office Innovations to Front Office Innovations a lot of value can be gained in due course of time. It gets reflected in ROIs as well, lets not forget this aspect. Firstly in reply to Isam's comment about Microsoft - that was your particular subsidiary, since I was involved in many of the back office innovations for North America I would disagree on the company as a whole, and whole hartedly agree with you about the group you worked with. Front Office innovation is "pretty" and can get a lot of attention because it often drives top line sales. Back Office innovation often saves money and heart ache, but it often costs jobs (drives the bottom line)...resulting in a cultural mindset of the change being more difficult to deal with acctually implementing until absolutely necessary. Many managers hold the innovations/improvements "in their pocket" until needed and implement only when necessary, such as a budget cut. Leaders prefer to implement over time so the organization has time to adapt and most often reinvest the cost savings back into their operations.